Attention: Avdel has changed the mandrel design for some of their Cherry "N" Rivets. The change has not effected the strength of the rivet. Substantial savings in installed costs can be realized when Cherry N Rivets are substituted for spotwelds, screws or bolts. Cherry Q Rivet mandrel plugs the entire length of the rivet sleeve, providing full shear strength values for structural or load-bearing applications. Quick and easy to use with hand or power riveters, Cherry N Rivets have endless fastening applications in manufacturing, maintenance. Specially designed mandrel of the Q Rivet is engineered to effect a seal, upon installation which offers resistance to leakage. 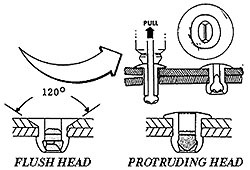 Unusual mandrel design of Cherry N Rivets holds rivet and mandrel firmly together prior to installation and insures positive mandrel retention in the installed rivet. Rivet sleeve curls over end of mandrel to insure its positive retention. As the mandrel is drawn into the rivet, the end of the rivet sleeve closes in an elliptical configuration... Iocking the mandrel firmly in place! ALUM RIVET / STEEL MAND. MONEL RIVET / STEEL MAND. STAINLESS RIVET / STAINLESS MAND. *All USM "Pop" rivets are 1/64" larger than nominal diameter. Presented here for cross reference purposes only. **Quotations on larger quantities. This specialty rivet was the only one that met my requirements. The serviced in sending it was excellent. The job is done. Thanks. Quality rivet pulls smoothly and makes a solid connection. The rivets are fine, but dont confuse these for MK-319. They are a different size. These small countersunk pop rivets are handy for mounting nut plates. The countersink angle (82, 100,degrees?) is not mentioned on your web page but it should be. Yes, the shear and tensile strength information can be found in the "Overview" tab of this web page. Rivet CCP-42 is a Cherry N Rivet with 1/8" diameter. The shear strength of this rivet is 450 lbs and the tensile strength is 600 lbs. Do I need a special tool to install these cherry rivets? You will need a general pop rivet gun / tool. Part number 12-00178 for example. Do you carry CherryMax CR3213 series of rivets? Yes, a keyword search for CR3213 on our website will bring the correct page to the search results. Is the price per rivet? Yes, these are priced and sold per rivet.